The two-day Citizens' Assembly on how Ireland can become a global leader in tackling climate change was described as "inspiring" by Chairperson Ms Justice Mary Laffoy. Ms Justice Laffoy said that it had been a very successful Assembly and had given the citizens a clear insight into the science and impacts of climate change, the status of Ireland’s efforts to tackle the issue, and how our energy systems need to change to respond to the challenge. Sustainable energy expert, Paul Kenny of the Tipperary Energy Agency, told the Assembly that the public needs to be made part of the solution by allowing the sale of electricity from the roofs of people’s homes, promoting community heating and co-operative wind energy. He said that at the moment Ireland's citizens are specifically excluded from benefiting from the energy transition that is taking place. Addressing the Assembly about what Ireland’s energy system would look like if it moved to a low carbon model, Dr Brian Motherway of the International Energy Agency said that Ireland is spending a quarter of a million euro abroad every 20 minutes to buy fossil fuels from other countries. He said that Ireland is giving money away despite the fact that it has some of the best renewable energy resources in the world. He said that wind energy has already reduced the carbon emissions from Ireland’s electricity sector by 20%, saved three million tonnes of carbon emissions going into the atmosphere, as well as hundreds of millions of euro that would have otherwise been spent on importing fossil fuels from other countries. Mr Motherway said that a low carbon future is not some distant utopia, and that the technologies to deliver it are already available today. Ms Justice Laffoy said that on the basis of the robust discussions at the Assembly yesterday about public and private responsibilities to take action, there is clearly a public appetite for climate-related actions in the energy area to be prioritised. Former Director of New and Renewable sources of Energy efficiency at the European Commission Marie Donnelly told the Assembly that it is very important to target older houses for energy upgrading. She said that 88% of the houses in Ireland were built before energy standards came in, and that it is a big challenge to tackle them for retreat-fitting of more efficient energy systems. She said it is a pity that the mortgage models do not exist in Ireland to allow people to release the equity they may have in their home to fund energy upgrades such as heat pumps and insulation. Ms Donnelly told the Assembly that Ireland has the highest source of onshore wind in Europe and even better offshore wind resources. She also said that Ireland is not on target to meet its EU renewable energy targets despite having some of the best renewable resources in Europe. 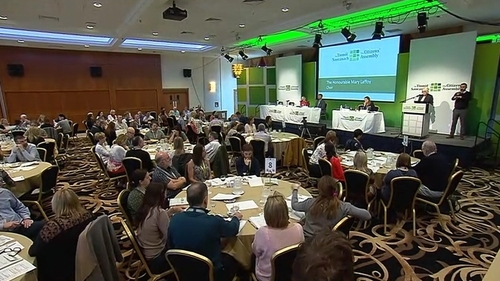 The Citizens' Assembly will meet again to discuss climate change on the weekend of 4-5 November before making recommendations to the Oireachtas.